Objective: The aim of the study is to evaluate the effectiveness of ultrasound (US)-guided interventional treatments in local tumor control (LTC) for thoracoabdominal wall seeding tumor (TAWST) from hepatocellular carcinoma (HCC), and explore the survival outcomes of the patients underwent surgical resection (SR) and microwave ablation (MWA) for intrahepatic tumor. Materials and Methods: A total of 40 patients with 47 TAWST from HCC were recruited from April 2007 to May 2018. LTC was evaluated by contrast-enchanced image. Long-time survival outcomes were compared. Overall survival (OS), disease-free survival (DFS), and local seeding progress-free survival (LSPFS) were analyzed. Results: One-year LTC rate was 65.2% in all patients; 72%, 0%, 50%, and 0% in the patients who underwent MWA, high-intensity focused US, iodine-125 (125I) brachytherapy and MWA combined with 125I brachytherapy, respectively. The 3-year OS, DFS rates and LSPFS rates were 51.8% and 28.6%, 12.0% and 23.8%, and 10.0% and 10.0% after MWA and SR, respectively. Univariate analysis results showed that age (P = 0.049), Karnofsky performance scale (KPS) (P = 0.002), and chemoradiation (P = 0.032); and multivariate analysis results showed that age (P = 0.045) and KPS (P = 0.010) might be predictors for LCT. While univariate analysis results showed that KPS (P = 0.032), intrahepatic tumor size (P = 0.006), chemoradiation (P = 0.003), preoperative alpha-fetoprotein level (P = 0.007), metastasis (P = 0.049), and albumin-bilirubin grade (P = 0.002), and multivariate analysis results showed that comorbidities (P = 0.004), KPS (P = 0.007), and metastasis (P = 0.009) might be predictors for OS. The pain degree of patients was improved obviously after treatments. Conclusions: US-guided interventional treatments were an effective option in LTC for TAWST from HCC, and MWA could achieve comparable long-time survival outcomes with SR for HCC patients with TAWST. Limited reports have provided some evidence for the efficacy of surgery or interventional treatment for TAWST from HCC. Takemura et al. reported that SR of the thoracoabdominal wall in HCC metastasis could provide acceptable long-term survival as long as the intrahepatic lesions are controlled. The cumulative 1-, 3-, and 5-year overall survival (OS) rates were 71%, 44%, and 39%, respectively, with a median survival time of 34.5 months. Previously, the results of SR and microwave ablation (MWA) for TAWST were compared in a retrospective study by our group, and the cumulative 1-, 3-, and 5-year OS rates were 82.6%, 73.5%, and 63% in the MWA group, and 72.2%, 56.1%, and 48.8% in SR group, respectively. However, this study was mainly focused on survival outcomes for patients; local tumor control (LTC) and the improvement to the physical status of the patients were not studied. Recently, US-guided MWA, radiofrequency ablation, iodine-125 (125I) seed implantation, and high-intensity focused US (HIFU) in the treatment of TAWST had been reported to hold therapeutic effectiveness against solid malignancies.,,, Thermal ablation has shown promise with respect to LTC and its minimally invasive advantages, but care must be taken to avoid burning adjacent tissue and skin. 125I seed implantation is a form of radiotherapy for unresectable tumor in trouble position. LTC was demonstrated to be improved with fewer complications using the modality that continuously delivers low doses of X-rays inside the tumor. Finally, HIFU can yield thermal coagulation necrosis of a target lesion without surgical exposure or insertion of applicators. Effective LTC was obtained though HIFU energy delivered from a US transducer. However, there is a paucity of data on the effectiveness of locally directed treatment of TAWST. The purpose of this study was to evaluate the effectiveness of US-guided interventional treatment of LTC for TAWST from HCC. In addition, a retrospective study was performed to explore the long-time survival outcomes of HCC patients with TAWST who underwent initial SR and MWA for intrahepatic tumors. This study is a retrospective analysis, approved by our Institutional Review Board. Each patient obtained informed consent for treatment procedures. The medical records of all HCC patients with thoracoabdominal wall seeding between April 2007 and May 2018 were reviewed. The eligibility criteria are selected as follows: (1) the entire TAWST could be showed clearly but US, (2) maximum diameter of TAWST ≤5 cm and the number <3, (3) Child-Pugh class A or B, (4) absence of hydrothorax or ascites, and (5) patients refused to receive surgery. The exclusion criteria are as follows: (1) severe cardiopulmonary disease, (2) severe coagulation abnormalities (prothrombin time >25 s, prothrombin activity >40%, and platelet count >40 cells × 109/L), and (3) serious infection. All selected patients accept US-guided interventional treatment due to tumor stage which made them inoperable or had comorbidities, advanced age, or refused to undergo SR. All thoracoabdominal wall nodules were seeding metastasis. During the study period, 3718 patients with 4424 HCCs who underwent various treatments, including SR, MWA, and so on in our hospital. Among them, 40 patients with 47 lesions (mean age: 56.4 years ± 9.9; range, 30–73 years) met the inclusion criteria and were included in our study. In addition, each patient received a Karnofsky performance scale (KPS) score to show his physical condition before the treatment. In all, ten patients with ten intrahepatic primary tumors accept SR, and 30 patients with 36 intrahepatic primary tumors accept US-guided MWA. The diagnosis of HCC was confirmed by pathologic findings in all patients from the SR group. For the MWA group, the diagnosis of HCC was based on pathologic findings of needle biopsy samples before ablation. The following demographic and clinicopathologic parameters was obtained from each patient [Table 1]: Age, gender, comorbidities, etiology, and cirrhosis; Child-Pugh grade, maximum diameter of the intrahepatic lesion, number of intrahepatic lesions, pathologic differentiation, and seeding characteristics; chemoradiation, metastasis, local tumor progression (LTP), and procedure session; and laboratory findings including alanine aminotransferase, aspartate aminotransferase, serum total bilirubin, serum albumin, and alpha-fetoprotein (AFP). The occur date and site of TAWST, and date and status on the last follow-up were collected. We also recorded the reasons for death. About 47 TAWST were found after the treatment for intrahepatic primary tumors, and the median time was 29.1 months (range, 0.9–143.9 months). In all, 24 seeding lesions located on the abdominal wall and 23 on the thoracic wall; 45 seeding lesions appeared on the right side and two on the subxiphoid. The median maximum diameter of seeding lesion was 2.3 (0.8–5) cm. Thirty-five patients had single tumor, and five patients had multiple tumors. Nine patients with seeding lesions were found within 1 year, and the 31 patients were found ≥1 year. All seeding lesions were treated by US-guided interventional treatment as follows: 34 patients accepted MWA, six patients accepted 125I seed implantation, three patients accepted MWA combined with 125I brachytherapy, and four patients accepted HIFU. In the 47 seeding lesions, 40 underwent one session and seven by two sessions. Ten (25%) patients accept chemotherapy or radiation after seeding was eradicated. A KY2000 MW ablation system (Kangyou Medical Instruments, Nanjing, China) consisting of two independent MW generators, two flexible coaxial cables and two water-pumping machines, which could drive two 15-G cooled-shaft antennae simultaneously was used. Before treatment, all patients were scanned using contrast-enhanced computed tomography (CT)/magnetic resonance imaging (MRI) and US, and an appropriate puncture route was chosen by US. After local anesthesia with 1% lidocaine, US-guided biopsy was performed in 2–3 separate punctures using an automatic biopsy gun with an 18-G cutting needle. Subsequently, the antenna was inserted percutaneously into the tumor and placed at designated sites under US guidance. One antenna was inserted into the center of tumors <1.7 cm, and multiple antennae were inserted into tumors 1.7 cm or larger. Two antennae were used simultaneously during MW ablation to achieve a larger ablation zone. A power output of 50W for 10 min was routinely used during MWA. After all the punctures, intravenous anesthesia with a combination of propofol (Diprivan; Zeneca Pharmaceuticals, Wilmington, Del) and ketamine (Shuanghe Pharmaceuticals, Beijing, China) was administered through the peripheral vein. If the heat-generated hyperechoic water vapor did not completely encompass the entire tumor, prolonged microwave emission was applied until the desired temperature was reached. When the tumor was located not ≥5 mm from the skin surface or adjacent to bowel, gallbladder or other important tissues, the hydrodissection was executed [Figure 1]. In addition, microwave needle tract need to be ablated during the needle withdrawal. For tumors with subcutaneous invasion, an ice bag was placed on the skin to avoid scalding during MWA. All patients were scanned using contrast-enhanced CT or MRI before US-guided 125I seed implantation. A series of imaging data related with seeding before interventional treatment were converted to Digital Imaging and Communications in Medicine format and then imported into three-dimensional (3D) visualization treatment platform (made in Hokai company, Zhuhai, China). The system assisted the radiologist in 3D reconstruction of the seeding lesion, surrounding tissues, and vessels; calculation of the required number of 125I seeds; and planning of the needle insertion path [Figure 2]. 125I radioactive seed (29.6 MBq, 0.8 mCi) (Beijing Atom and High Technique Industries Inc., Beijing, China) has a half-life of 59.4 days with a low energy level of 27.4 KeV and the seed distance of 1 cm. 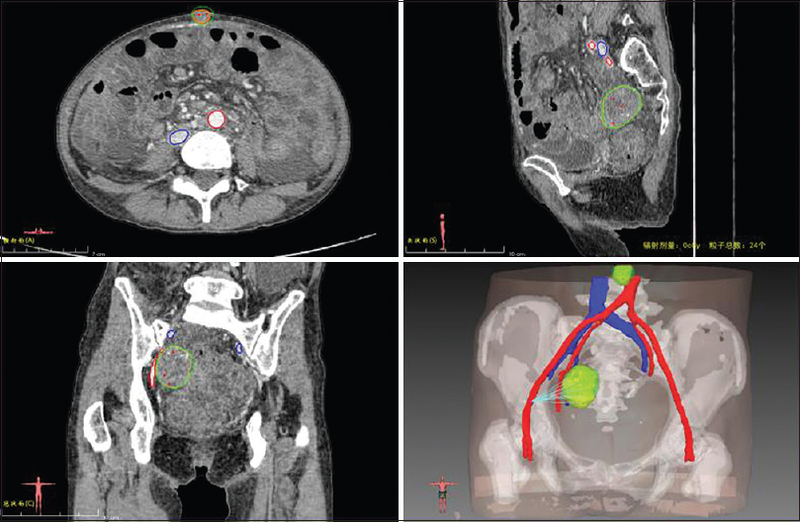 Patient's position was dependent on the location of the tumors. Electrocardiography monitoring was used when necessary during the procedure. Conventional gray scale US or contrast-enhanced US (CEUS) was used to find a safe puncture path, and guide the procedure. An 18-G needle was placed into the tumor lesions, and the radioactive seeds were implanted using a Mick applicator and spaced at intervals of 1.0 cm using the same needle. After the seed implantation, the needle was withdrawn, and then the puncture point was sterilized with alcohol. The presence of abnormal effusion or hematoma around the treated lesion was checked with US. According to preoperative planning based on size, shape, and location of seeding lesion in 3D visualization treatment platform, the protocols of MWA combined with 125I seed implantation were used. US-guided MWA for seeding lesion was applied, and postoperative evaluation was used by CEUS. The residual seeding lesion was treated by 125I seed implantation, which was arranged in a few days. A HIFU system (model JC; Chongqing Haifu Technology, Chongqing, China) was used to treat the seeding lesions using real-time US guidance. The focused US energy is produced from a 20-cm diameter therapeutic transducer with a focal length of 120 mm operating at a frequency of 0.9 MHz. The focal region is 6.8 mm along the beam axis and 1.2 mm in the transverse direction. In the center of the HIFU transducer, a 5–8 MHz linear array diagnostic US probe is mounted coaxially as the imaging unit of the system to provide real-time imaging for targeting. The integrated transducer is immersed in a water reservoir filled with degassed water maintained at a temperature of 12°C–15°C. During treatment, the HIFU beam was directed upward toward the seeding lesion. All postprocedure imaging to assessment of local seeding lesion control was retrospectively reviewed by two interventional radiologists who had 10 years of imaging diagnosis experience. LTP was defined based on imaging findings of irregular nodular, scattered, or eccentric pattern of peripheral enhancement around the local treatment zone on first posttreatment imaging within 60 days was considered residual seeding lesion (6.4%, 3/47). Any follow-up imaging of ≥60 days after local treatment was assessed for tumor progression. 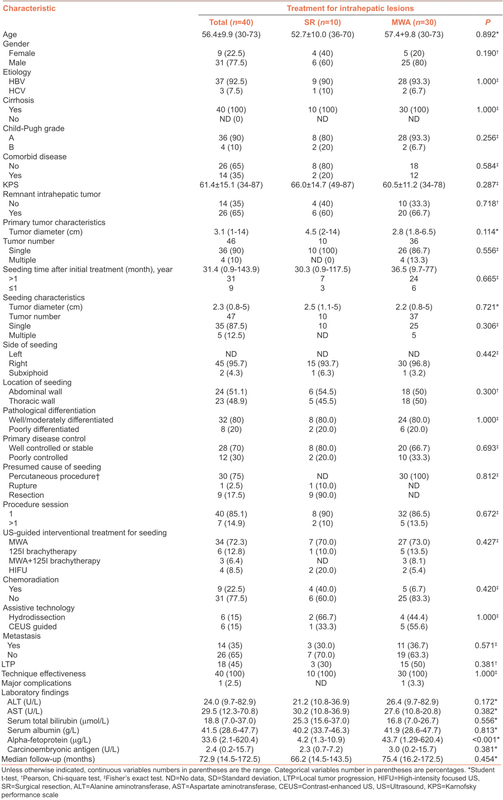 Enhanced US, CT, MRI, and PET/CT imaging was available for 53.2% (25/47), 23.4% (11/47), 63.8% (30/47), and 21.3% (10/47) of seeding lesions, respectively. If tumor progression and/or residual tumor were seen on initial follow-up imaging, duration of LTC was considered to be 0 days. If the patient died or was otherwise lost to follow-up, the duration of LTC was based on their last set of imaging showing no residual or recurrent disease. Follow-up imaging was performed at 1, 3, 6, 9, and 12 months after interventional treatment for the 1st year and every 6 months thereafter. Thereafter, the follow-up visit covered several evaluations, including routine physical examination and laboratory tests such as total bilirubin, serum albumin, and tumor marker levels, and parameter related to liver function. 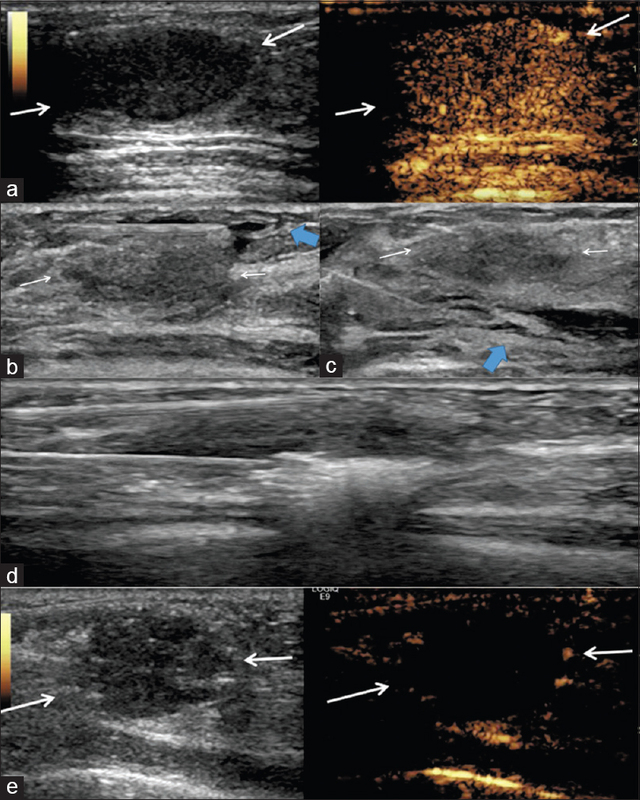 Technique effectiveness was defined as the absence of contrast-enhancement on imaging in any area of the mass after 1 month. All these patients accepted preoperative and postoperative review by enhanced MRI and US shows in. Intervals for CT/MRI were shortened when levels of tumor marker were increased after the treatment. If no viable lesion was detected on CT/MRI (with enhancement in the arterial phase), the intrahepatic lesions were regarded as well controlled. If viable lesions were decreased or unchanged in size and number, the disease was considered as stable, whereas the presence of new lesions or an increase of at least 20% in the sum of the diameters of remnant intrahepatic viable lesions indicated a poor control. Complications were defined in line with the HCC ablation reporting standards. Follow-up was closed until the last visit or on the time of death and seeding lesions progression. Pain scores were obtained for 57.4% (27/47) of treated seeding lesion before and 4 weeks after the procedure and were compared using the Mann–Whitney U-test. MWA was used for 66.7% (18/27) of lesions, 22.2% (6/27) were treated with 125I brachytherapy, and HIFU was used for 3.7% (1/27). Patients treated for pain palliation had a pain score of based on the Numerical Rating Scale (NRS; 10 points pain score with ten representing maximal pain) before treatment. Successful pain palliation was defined as a decrease in NRS by ≥2. Pain increase was defined as any increase in NRS pain score after the treatment. Data between the MWA and SR groups were compared with the Student's t-test. Continuous variables were analyzed by the Wilcoxon signed-rank test, and categorical variables were analyzed using either the Pearson's Chi-square test or the Fisher's exact test. OS, disease-free survival (DFS), and local seeding progress-free survival (LSPFS) were assessed by the Kaplan–Meier method with log-rank test. A Cox proportional hazards model was used to identify the significant effects of multiple factors on survival and local progress rate. Statistical analyses were performed using SPSS 19.0 (SPSS, Chicago, IL, USA). For all tests, P < 0.05 was considered to be statistically significant. Thirty-five TAWST were lost to follow-up at various time points. Local seeding lesions control results are summarized in [Table 2]. Over local control rates were 89.4%, 74.5%, 70%, 65.2%, 42.1%, and 33.3% in 3, 6, 9, 12 months, 2 and 3 years, respectively. The 3, 6, 9, 12 months, 2 and 3 years of LTC rates in TAWST from HCC were 91.2%, 79.4%, 68.7%, 60%, 22,6%, and 33.3% for MWA; 100%, 100%, 100%, 50%, 0%, and 0% for 125I brachytherapy; 50%, 50%, 25%, 25%, 0%, and 0% for HIFU; 100%, 80%, 80%, 70%, 33.3%, and 25% for local interventional treatment combined with chemoradiation, respectively. The median follow-up period was 72.6 months (range, 14.5–172.5 months). The 1-, 3-, and 5-year cumulative OS rates were 100%, 83.1%, and 42.4%. The 1-, 3-, and 5-year cumulative DFS rates were 75%, 30%, and 10%. The 1-, 2-, and 3-year cumulative LSPFS rates were 65.0%, 45.0%, and 16.7%. The median follow-up period was 75.4 months (range, 16.5–172.5 months) in the MWA group, and 66.2 months (range, 14.5–143.5 months) in the SR group. Mortality rate was 26.7% (eight of 30 patients) in the MWA group, four patients (40%; four of 10 patients) died in the SR group, and the cause of death in both was HCC local or systemic progression. On the basis of follow-up imaging, 100% technique effectiveness was achieved in both groups (MWA: 30 of 30 treatments; SR: 10 of 10 treatments). The 1-, 2-, and 3-year cumulative LSPFS rates in the MWA group and SR group were 62.9%, 44.9%, and 12.0% and 71.4%, 47.6%, and 23.8%, respectively [Figure 3]a, showing no significant statistical difference (P = 0.732). The 1-, 3-, and 5-year cumulative OS rates in the MWA group and SR group were 100%, 82.9%, and 51.8% and 100%, 83.3%, and 28.6%, respectively. [Figure 3]b, showing no significant statistical difference (P = 0.879). The 1-, 3-, and 5-year cumulative DFS rates in the MWA group and SR group were 80%, 40%, and 10% and 70%, 10%, and 10%, respectively. [Figure 3]c, showing no significant statistical difference (P = 0.482). The univariate analysis [Table 3] showed statistically significant differences between groups in terms of local seeding progress rates, depending on the age (χ2 = 3.795; P = 0.049), KPS (χ2 = 9.511; P = 0.002), and chemoradiation (χ2 = 4.625 P = 0.032). The multivariate analysis [Table 3] showed that the factors that significantly affected the local seeding progress rate were age (P = 0.045) and KPS (P = 0.010). 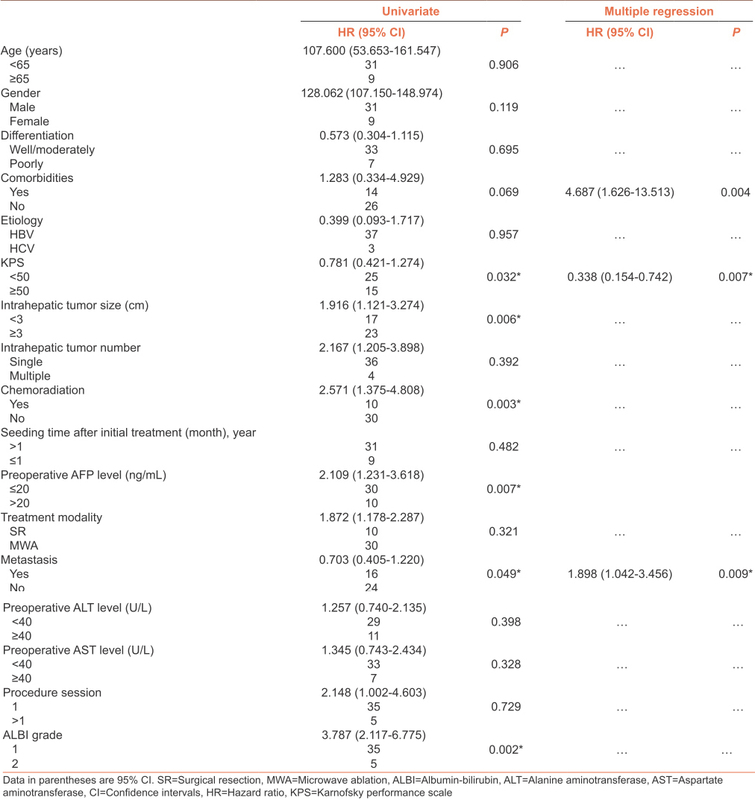 The univariate analysis [Table 4] showed statistically significant differences between groups in terms of OS rates, depending on the intrahepatic tumor size (P = 0.006), preoperative AFP level (P = 0.007), metastasis (P = 0.049), chemoradiation (P = 0.003), and albumin-bilirubin grade (P = 0.002). The multivariate analysis showed that the factors that significantly affected the survival rate were comorbidities (P = 0.004), KPS (P = 0.007), and metastasis (P = 0.009), [Table 4]. Median pain scores decreased from 6 (interquartile range: 5.0–9.0) to 3 (interquartile range: 1.0–4.0), 1 month after US-guided interventional treatment (P < 0.001). Remaining pain palliation results are summarized in [Table 5]. Moreover, one patient increased pain after therapy. A 65-year-old male with diabetes and the lesion measured 32.8 cm3 (MTD: 5.0 cm) and was treated with MWA with pre- and post-ablation pain scores of 4 and 7. No mortality was directly related to any of treatment procedures. Two major complications (5%; two of 40 patients) occurred after US-guided interventional treatment with 50 sessions. These adverse events were abdominal wall edema which occurred in one patient and persistent pain in another patient who had diabetes. Seeding lesions in thoracoabdominal wall are primarily induced by implanted tumor cells, which originate during the passageway of a needle or incision after the treatment.,, The incidence of such a phenomenon, although very low, has a relatively high-reoccurrence rate. SR was the first choice for treatment of seeding on the chest or abdominal wall, although it carries a risk of hemorrhage and possible postoperative incisional hernia, and patients usually require further reconstruction, such as abdominoplasty. In contrast, US-guided interventional treatment has minimally invasive characteristics, which is a better choice to treat our patients who had poor physical condition and immunologic status. According to seeding lesion size and location, three types of antennae, including 0.5, 0.7, and 1.1 cm of tips, were used in this study. Previous research reported that an antenna tip of 0.7 cm and 0.5 cm can ablate a diameter of 2.4–2.6 cm and 2.2–2.4 cm, respectively, in ex vivo porcine livers with an output power of 60 W and a setting time of 10 min. Therefore, the ablation zone is relatively small, and hydro-dissection was used on our patients by injecting 0.9% saline between tumor and subcutaneous tissue which avoids burning the skin in the superficial tumor during the procedure., In addition, 125I seed implantation has emerged as another percutaneous treatment modality and has achieved good therapeutic effects for inoperable malignancies., In this study, we used 3D visualized seed planning, developed in our laboratory, to assist the operators in performing the 125I seed implantation procedure for the seeding lesion, and improve the efficiency and accuracy of implantation. For tumors with irregular shape or special position, we used this protocol that MWA for eradicate most proportion of seeding lesion and the remnant part implant 125I seed. Compared to the above-mentioned types of treatments, HIFU ablation is an extracorporeal treatment, which may become an attractive option for the treatment of seeding. US-guided interventional treatment is a safe, effective therapy for achieving local control and pain palliation during seeding of the thoracoabdominal wall. Aggressive local treatment with the intent of achieving seeding lesion control has been performed for varying indications depending on the clinical circumstances. In this study, the 1-year overall local control rate for seeding that underwent interventional treatment was 65.2%. Among these minimally invasive treatments, MWA had the highest 1-year local control rate and there was no significant statistical difference between different interventional treatments in the follow-up period. Age and KPS had a significant impact on local seeding progression. These two factors can explain tumor recurrence associated with poor physical condition. Moreover, 60% (15/25) of lesions treated with MWA resulted in pain palliation at 1 month and local control at 3 months, suggestive of a correlation between these two goals of therapy. In this study, ten patients with HC underwent SR and 30 patients underwent MWA. Seeding was found on the thoracoabdominal wall after 29.1 months and all patients accepted US-guided interventional treatment. 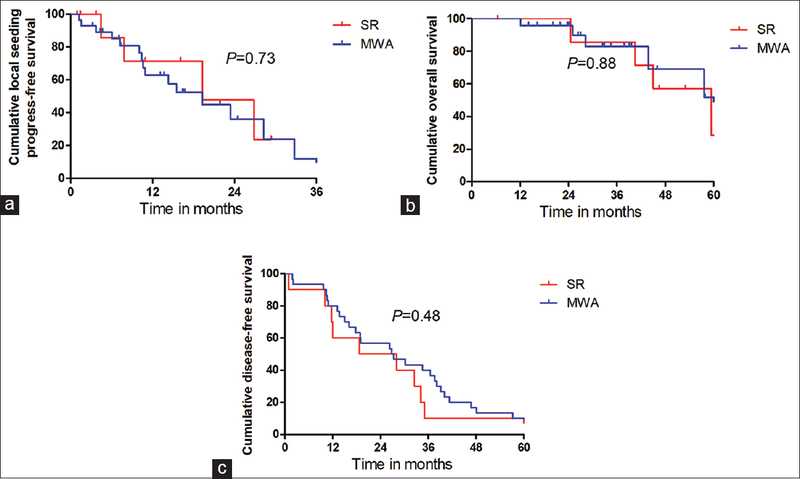 Compared with SR, MWA had comparable long-term survival outcomes as patients with HCC seeding. The present study analyzed the prognostic factors associated with the survival of HCC patients with seeding. It is worthy of note that the time of seeding occurrence after initial treatment had no significant impact on both OS and DFS, suggesting that HCC implantation time had no associations with the patient survival. Fewer comorbidities, high KPS and metastasis were identified as factors predictive of prolonged OS. Metastasis was considered to represent less invasive biologic behavior of the tumor, and therefore correlated with improved survival. Comorbidities and KPS indicate that immune surveillance and defense of patients enabled the immune system to eliminate the residual and migrating tumor cells. Ten patients accepted chemoradiation treatments including four with SR and six with MWA. Univariate analysis found that chemoradiation could prolong a patient survival which is a similar outcome as previously reported. There were two complications and not excluding skip burn. Given that we used 3D visualized seed planning and hydrodissection, the occurrence rate of skip burn should be reduced significantly and requires a larger sample size for further study. An important limitation of this study was its retrospective design with a relatively small patient series. A limited sample sizes may have reduced the statistical power of the comparative analysis so that some associations were not detected. Furthermore, the success of MWA was assessed by radiographic findings versus pathologic margin-free status. Therefore, despite intermediate follow-up being reported, it might take longer for radiographic techniques to detect MWA failures. Finally, besides HCC patients with seeding who underwent MWA, data on other treatment modalities were few. In summary, US-guided interventional treatments represent an effective option for the LTC from HCC. Finally, MWA had comparable long-term survival outcomes as SR for HCC patients with TAWST. This work was supported by the National Key R&D Program of China (No. 2017YFC0112000), three grants 81430039, 81627803, and 81801723 from the National Scientific Foundation Committee of China; 2017FC-CXYY-3005 from the Clinical Research Support Foundation of the Chinese, PLA General Hospital. Oliveri RS, Wetterslev J, Gluud C. Hepatocellular carcinoma. Lancet 2012;380:470. Tang A, Hallouch O, Chernyak V, Kamaya A, Sirlin CB. Epidemiology of hepatocellular carcinoma: Target population for surveillance and diagnosis. Abdom Radiol (NY) 2018;43:13-25. Zuo TT, Zheng RS, Zhang SW, Zeng HM, Chen WQ. Incidence and mortality of liver cancer in China in 2011. Chin J Cancer 2015;34:508-13. Katyal S, Oliver JH 3rd, Peterson MS, Ferris JV, Carr BS, Baron RL, et al. Extrahepatic metastases of hepatocellular carcinoma. Radiology 2000;216:698-703. Yeh CN, Chen MF. Resection of peritoneal implantation of hepatocellular carcinoma after hepatic resection: Risk factors and prognostic analysis. World J Surg 2004;28:382-6. Zhong-Yi Z, Wei Y, Kun Y, Ying D, Wei W, Jung-Chieh L, et al. Needle track seeding after percutaneous radiofrequency ablation of hepatocellular carcinoma: 14-year experience at a single centre. Int J Hyperthermia 2017;23:1-8. Aldahham A, Boodai S, Alfuderi A, Almosawi A, Asfer S. Abdominal wall implantation of hepatocellular carcinoma. World J Surg Oncol 2006;4:72. Stojadinovic A, Hoos A, Karpoff HM, Leung DH, Antonescu CR, Brennan MF, et al. Soft tissue tumors of the abdominal wall: Analysis of disease patterns and treatment. Arch Surg 2001;136:70-9. Li A, Wu B, Cui L, Wu M. Successful en bloc resection of recurrent hepatocellular carcinoma directly invading the abdominal wall: A case report. J Med Case Rep 2015;9:19. Qi C, Yu XL, Liang P, Cheng ZG, Liu FY, Han ZY, et al. Ultrasound-guided microwave ablation for abdominal wall metastatic tumors: A preliminary study. World J Gastroenterol 2012;18:3008-14. Lin J, Yang W, Jiang N, Zheng Q, Huang J, Huang N, et al. Incidence and prediction of seed migration to the chest after iodine-125 brachytherapy for hepatocellular carcinoma. Brachytherapy 2017;16:1252-6. Takemura N, Hasegawa K, Aoki T, Sakamoto Y, Sugawara Y, Makuuchi M, et al. Surgical resection of peritoneal or thoracoabdominal wall implants from hepatocellular carcinoma. Br J Surg 2014;101:1017-22. An C, Hu ZL, Liang P, Cheng ZG, Han ZY, Yu J, et al. Ultrasound-guided percutaneous microwave ablation vs. surgical resection for thoracoabdominal wall implants from hepatocellular carcinoma: Intermediate-term results. Int J Hyperthermia 2018;34:1067-76. Tu JF, Ding YH, Chen L, Ying XH, Zhang DK, Wu FZ, et al. 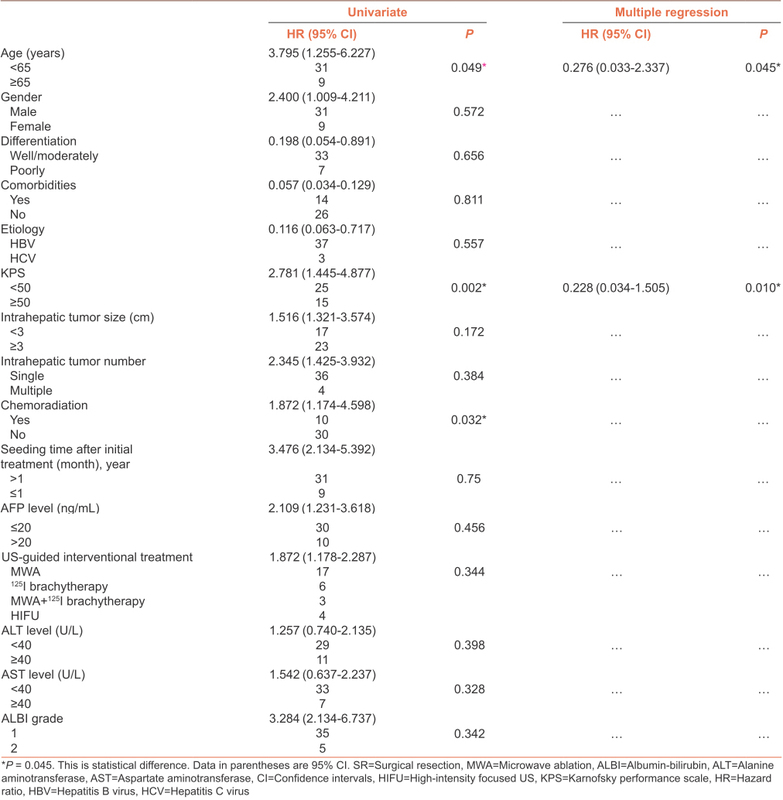 Iodine-125 brachytherapy prophylaxis after radiofrequency ablation cannot benefit patients in high risk of locoregional hepatocellular carcinoma recurrence. Sci Rep 2017;7:3689. Liang P, Yu J, Yu XL, Wang XH, Wei Q, Yu SY, et al. Percutaneous cooled-tip microwave ablation under ultrasound guidance for primary liver cancer: A multicentre analysis of 1363 treatment-naive lesions in 1007 patients in China. Gut 2012;61:1100-1. Zavaglia C, Mancuso A, Foschi A, Rampoldi A. High-intensity focused ultrasound (HIFU) for the treatment of hepatocellular carcinoma: Is it time to abandon standard ablative percutaneous treatments? Hepatobiliary Surg Nutr 2013;2:184-7. Song Z, Qi H, Zhang H, Xie L, Cao F, Fan W, et al. Microwave ablation: Results with three different diameters of antennas in ex vivo bovine and in vivo porcine liver. J Cancer Res Ther 2017;13:737-41. Terret C, Albrand G, Moncenix G, Droz JP. Karnofsky performance scale (KPS) or physical performance test (PPT)? That is the question. Crit Rev Oncol Hematol 2011;77:142-7. Topham D, Drew D. Quality improvement project: Replacing the numeric rating scale with a clinically aligned pain assessment (CAPA) tool. Pain Manag Nurs 2017;18:363-71. Fung E, Strosberg DS, Jones EL, Dettorre R, Suzo A, Meara MP, et al. Incidence of abdominal wall metastases following percutaneous endoscopic gastrostomy placement in patients with head and neck cancer. Surg Endosc 2017;31:3623-7. Tchatalbachev VV, Kirkpatrick DL, Duff DJ, Travis MD. Seeding of the rectus sheath with hepatocellular carcinoma after image guided percutaneous liver biopsy using coaxial biopsy needle system. J Radiol Case Rep 2015;9:18-25. Soyer P, Pelage JP, Dufresne AC, Boudiaf M, Rymer R. Abdominal wall metastatic tumor seeding along a percutaneous abscess drainage tract. AJR Am J Roentgenol 1998;171:1643-4. Robertson JD, de la Torre JI, Gardner PM, Grant JH 3rd, Fix RJ, Vásconez LO, et al. Abdominoplasty repair for abdominal wall hernias. Ann Plast Surg 2003;51:10-6. Yu J, Liang P. Status and advancement of microwave ablation in China. Int J Hyperthermia 2016;1:1-10. Yu J, Liang P, Yu X, Liu F, Chen L, Wang Y, et al. Acomparison of microwave ablation and bipolar radiofrequency ablation both with an internally cooled probe: Results in ex vivo and in vivo porcine livers. Eur J Radiol 2011;79:124-30. Cheng Z, Yu X, Han Z, Liu F, Yu J, Liang P, et al. Ultrasound-guided hydrodissection for assisting percutaneous microwave ablation of renal cell carcinomas adjacent to intestinal tracts: A preliminary clinical study. Int J Hyperthermia 2018;34:315-20. Hu Y, Qi E, Liu F, Lu Y, Tan S, Sun Y, et al. The application of a three-dimensional visualized seed planning and navigation system in 125I seed implantation for pancreatic cancer. Onco Targets Ther 2018;11:619-27. Li W, Man W, Guo H, Yang P. Clinical study of transcatheter arterial chemoembolization combined with microwave ablation in the treatment of advanced hepatocellular carcinoma. J Cancer Res Ther 2016;12:C217-C220. Goldfarb Y, Sorski L, Benish M, Levi B, Melamed R, Ben-Eliyahu S, et al. Improving postoperative immune status and resistance to cancer metastasis: A combined perioperative approach of immunostimulation and prevention of excessive surgical stress responses. Ann Surg 2011;253:798-810. Nishikawa H, Nishijima N, Enomoto H, Sakamoto A, Nasu A, Komekado H, et al. Predictive factors in patients with hepatocellular carcinoma receiving sorafenib therapy using time-dependent receiver operating characteristic analysis. J Cancer 2017;8:378-87.